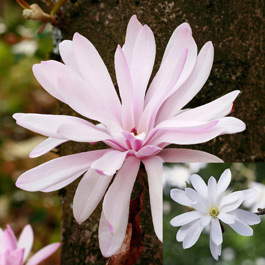 This fantastic collection includes two varieties of Star Magnolia to create an elegant spring display. Growing to a height of 1.5-2m they are ideal for planting in pots and containers. Flowers March-May. Our collection includes two each of Royal Star (white) and Rosea (pink, matures to white). 9cm pot plants supplied.